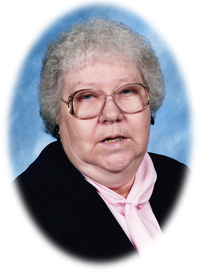 Ida Bogenhagen, 82, of Aberdeen, SD formerly of White Lake, SD died Friday, May 4, 2018 in her home. Funeral services will be 2:00 pm Wednesday, May 9 at Trinity Lutheran Church in White Lake. Burial will be in the Trinity Lutheran Cemetery at rural White Lake. Arrangements are with the Bittner Funeral Chapel in Mitchell. Ida Bogenhagen was born September 24, 1935 to Bill and Lydia (Pfaff) Fehn in Belvidere, SD. She was baptized at one year of age at Lutheran country church at Belvidere and confirmed at the Lutheran Church in Wessington Springs on April 6, 1952. She attended country grade school at Belvidere and moved to Wessington Springs where she finished her schooling and helped on the farm. Ida married Elmer Bogenhagen on May 27, 1962 at the Trinity Lutheran Church in White Lake. They made their home in the family farm for 38 years. Ida moved to town in 2001 where she continued to work at the Aurora Brule Nursing Home for a total of 23 years. Ida moved to Aberdeen in 2008 where she lived at the Homestead apartments enjoying her retirement while drinking coffee and playing card games with her many new friends. Ida was a member of the Lady’s aid at the Trinity Lutheran Church and a member of the Legion Auxiliary. She will always be remembered for the wonderful work she did at the nursing home and the care she gave to the residents she took care of. She is survived by five wonderful children: Ann (Rod) Feltman, DeSmet; Doug (Tammy) Bogenhagen, LaVista, NE; Steve Bogenhagen, Aberdeen; Elaine (John) Fuoss, Sioux Center, IA; and Mary (Kevin) Haberman, Sioux Falls; 7 grandchildren: Travis (Jennifer) Feltman; Kelsey (Luke) Smith; Jackie Bogenhagen; Jared Bogenhagen; Keygan Bogenhagen; Tiffiny Fuoss; Randy Fuoss; 1 step-grandchild: Kassidy Haberman; and 2 great-grandchildren: Riley and Hudson Feltman. She is preceded in death by her husband, Elmer, her parents, and 3 sisters.